I need to make this fairly quick as I really need a Battlefield 3 fix. Fantastic game…if you game…go and get it and look for me online, kingbobyjr. Be warned…you will get smoked…just not by me. I will leave that to the 14 year olds who have nothing better to do than play games all day long. 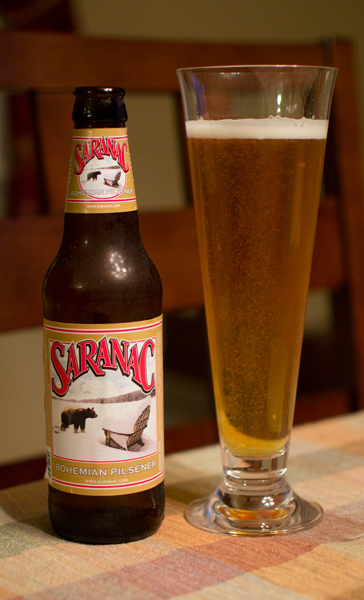 Beer #333 is Saranac Bohemian Pilsener by Matt Brewing Company. This Czech Pilsener, a new style of beer for me, with an ABV of 4.8% is brewed in Utica, New York. Appearance – A really nice clear gold with frothy, creamy thin white head. There was close to one million bubbles putting on a glorious show as they were trying to escape the Pilsner (Pilsener…looks like it can be spelled both ways) glass. Excellent lacing. Nose – Very mild nose with some grains, hay and grass. Taste – A bit of a cracker flavor…not Saltines but more like a Ritz minus the buttery thing. A bit of a lemon rind flavor and bitterness. A bit spicy with black pepper. Mouthfeel – Light bodied, crisp, high carbonation…this would probably be quite refreshing on a hot summer day which have gone the way of the DoDo bird…until next summer that is. Overall – I have to be honest…I wasn’t expecting much being I’m not a huge fan of Pilsners in general. This was a very drinkable beer though being a King and all, I would still give this to the Jester…and so I shall.